To use Moira efficiently, you should understand its underlying design decisions. We often notice that when new users create their first triggers, they set thresholds at random, or by intuition. It happens because when you configure your first 24/7/365 automated monitoring system, you don’t really know how your system works. If you have at least hundreds of metrics, it’s impossible to watch all of them with your eyes. What are the limits of your system? How often does your system reach critical resource consumption during a day? Should you immediately react when metric X reaches value N, or is it a fluctuation that passes by itself? Later, when you learn to understand you system, you will need to adjust your triggers. And that’s when you need to understand Moira. Unlike many other tools providing several distinct level systems like “priority” and “severity”, Moira supports a single set of states. Every state has a well-defined meaning, and you should use these states accordingly. This is a basic state, in which all your metrics must spend most of their time. Just like you keep your autotests green, you should keep your metrics green. This state means that you should do something to prevent ERRORs in the future. Not immediately: maybe you should order more hardware from your vendor, or plan to optimize code in the next iteration. You can configure less intrusive delivery channels here, like email. Metrics can be in this state for days or even weeks. This is a critical condition that requires immediate intervention. Your datacenter is on fire. All application processes shut down. There is no disk space left on your database server to process million-dollar transactions. These notifications are important enough to wake you up at night. You can still configure schedules to assign shifts to several engineers, though (see Schedules). You should configure more intrusive delivery channels here, like Pushover. 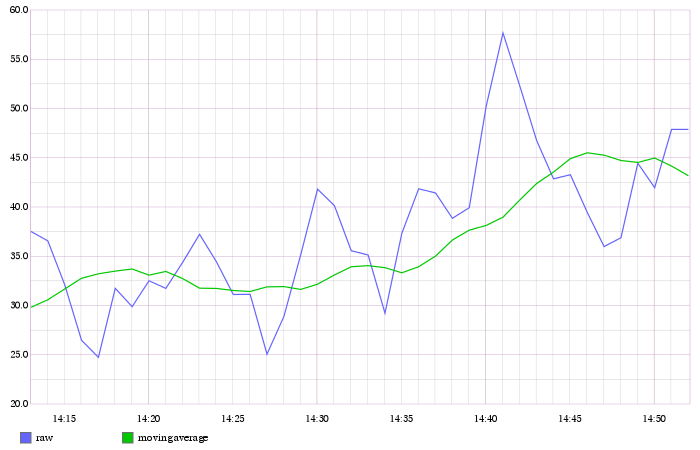 Metrics should not be in this state for more than several hours. Moira will send you reminders every 24 hours if some of your metrics remain in this state. If a delivery channel supports high-priority messages (like Pushover does), Moira will try to use them for ERRORs. In the beginning every metric is in this state. You will receive one NODATA → OK notification when the first data point arrives. Moira will set NODATA state only for known metrics - i.e. for metrics that have sent at least one data point to Moira. This is an error inside Moira. Unless you have bad syntax in your Advanced Mode Trigger trigger, this has nothing to do with your metric state. You should try to fix or update Moira, or contact Moira developers (see Contact Moira Developers). Sometimes it’s hard to maintain strict rule of keeping your metrics green, if your triggers switch OK → ERROR → OK → ERROR for short periods of time several times a day. It can lead to alarm fatigue and missing actual failures. There is no single recipe for eliminating false positives, but here are some tips. If you are experiencing peaks on you graphs that lead to unnecessary state switches, you can alleviate these peaks with movingAverage or movingMedian. If you are interested in aggregate 10-minute values, not single minute values, use movingSum. If you want zeros instead of missing data points, use transformNull. Also, keepLastValue is useful when dealing with missing points. Avoid functions that show and hide metrics, like averageAbove. Moira does not consider hidden metrics to be in NODATA state. Instead, Moira retains last state that the metric had when it was visible. Always draw a graph of target(s) you are planning to monitor. Use generic Graphite web interface or something like Grafana. Look for minumum and maximum values. Notice, how often and for how long the graph crosses your planned thresholds. Try to correlate the graph with previous system failures. Then, copy and paste corrected target to Moira. Of course, you may and should remove any functions that make no sense in Moira (like sortByTotal) and can generate unwanted side effects (like averageAbove).